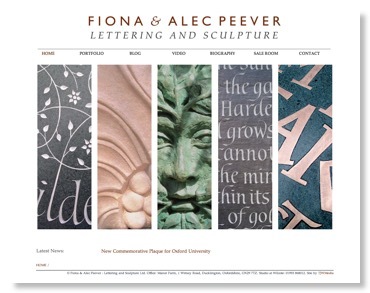 Fiona & Alec Peever are artists specialising in sculpture and letter carving - their contemporary designs are hand carved in stone and cast in bronze. Being artists they already had a web sit design in mind when they came to me to redesign their website and invigorate their business. The solution I came up with involved implementing their design ideas with a content management solution, that was simple and reliable for them to use, even with an old PC. This allowed them the freedom to be able to update entire website, including text and image portfolios of their work, without having to learn new skills and so concentrate on their artistic work.